Corrosion in concrete is majorly due to carbonisation and chlorination. When concrete carbonates to the level of the steel rebar, the normally alkaline environment, which protects steel from corrosion, is replaced by a neutral environment. Under these conditions the steel is not passive and rapid corrosion begins. The rate of corrosion due to carbonated concrete cover is slower than chloride-induced corrosion. Occasionally, a lack of oxygen surrounding the steel rebar will cause the metal to dissolve, leaving a low pH liquid. Carbon-dioxide combines with water to form acid in which reduce the pH of concrete by consuming the calcium hydroxide which is formed in hydration process of cement, at low pH corrosion begins. Prevention of carbonization, prevent the alkalinity in which corrosion do not take place. Chloride in the pore of concrete involves during the corrosion only, it just acts as the catalyst in the corrosion process. 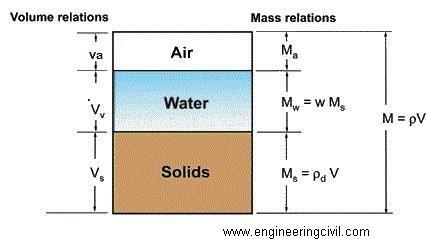 Presence of chloride in concrete pore is inert at alkaline condition. The two electrons (2e) created in the anodic reaction must be consumed elsewhere on the steel surface to preserve electrical neutrality. The ion dissolve in the pore water would not see cracking and spalling of the concrete. Several more stages must occur for ‘rust’ to form. Ferrous hydroxide becomes ferric hydroxide and then hydrated ferric oxide or rust. 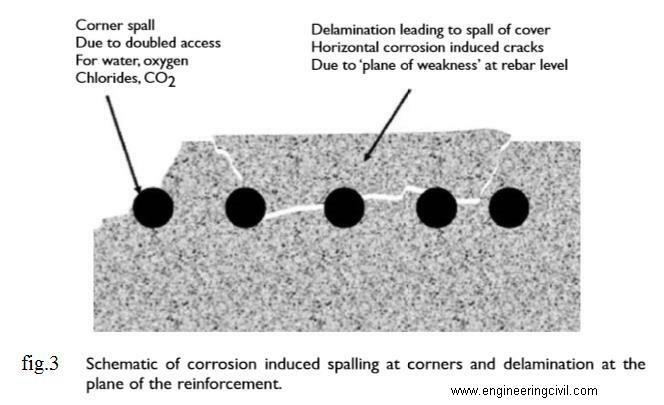 This rust cause spalling and crack over the concrete as shown in fig.3. 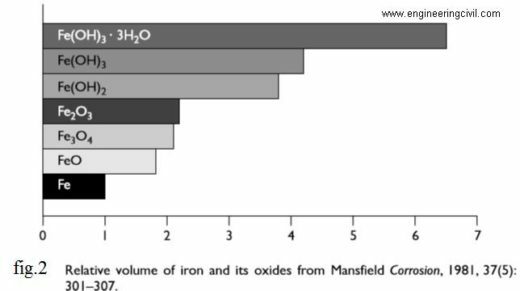 Unhydrated ferric oxide Fe2O3 formed in the a bow reaction has a volume of about twice that of the steel it replaces when fully dense. When it becomes hydrated it swells even more and becomes porous. This means that the volume increase at the steel/concrete interface is six to ten times . This leads to the cracking and Spalling as shown in fig.3, that we observe as the usual consequence of corrosion of steel in concrete and the red/brown brittle, flaky rust we see on the bar and the rust stains we see at cracks in the concrete. Fig.2 shows the relative volume of the iron and its oxide formed in corrosion process. There is a lot more calcium hydroxide in the concrete pores that can dissolve in the pore water. This helps maintain the pH at its usual level of 12–13 as the carbonation reaction occurs. However, as carbon dioxide proceeds to react with the calcium (and other) hydroxides in solution, eventually all the calcium hydroxide reacts, precipitating the calcium carbonate and allowing the pH to fall to a level where steel will corrode. 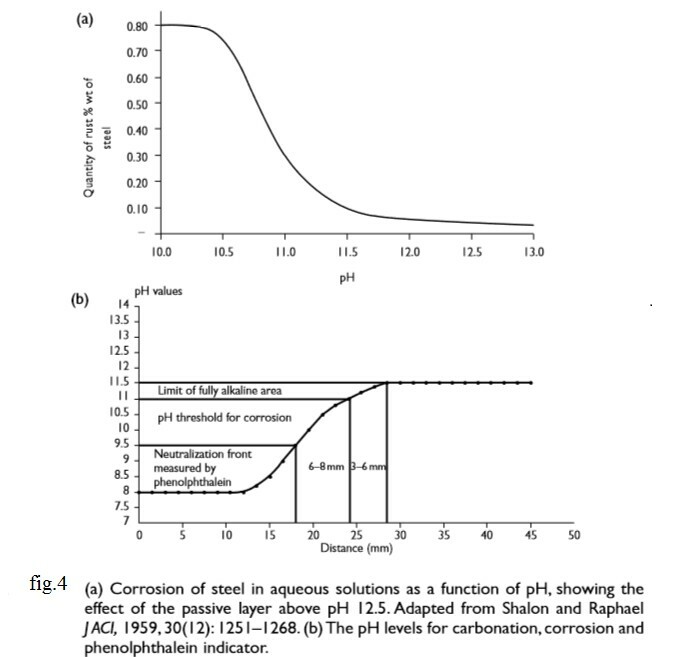 This is illustrated in  Figure 4(a) and (b) which show the pH drop across the carbonation front and the corrosion rate of steel as the pH changes. At the carbonation front there is a sharp drop in alkalinity from pH 11–13 down to less than pH 8. At that level the passive layer was created by the alkalinity, is no longer sustained so corrosion proceeds by the general corrosion mechanism will takes place. The chloride ion attacks the passive layer although in this case (unlike carbonation) there is no overall drop in pH. Chlorides act as catalysts to corrosion. They are not consumed in the process but help to break down the passive layer of oxide on the steel and allow the corrosion process to proceed quickly as shown in fig.5. The effective recycling of chloride ions makes chloride attack more difficult to remedy as chlorides are therefore harder to eliminate. Fig.4 shows the recycling of chloride ion. Obviously a few chloride ions in the pore water will not break down the passive layer. Carbon dioxide and chloride present in the concrete are inert in the absence of the water and oxygen. Carbon dioxide in the pore of the concrete reacts with water to form carbonic acids which reduce the pH of the concrete. In the absence of water carbon dioxide is in active. Chloride in concrete is also in active at alkaline condition. 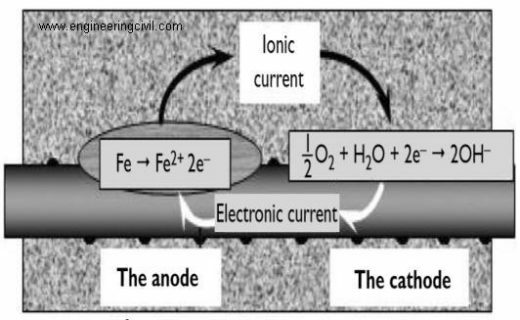 In corrosion process carbon-dioxide acts as initiator and chloride acts as a catalyst. We can prevent corrosion by preventing the contact of water, carbon- dioxide and oxygen. Even in presence of water steel will not undergoes corrosion at alkaline environment. The bacteria and Ca(OH)2 of pH 13 is added to the concrete in a capsules. The bacteria are Bacillus alkali-nitrulicus, an alkali-resistant soil bacterium, psychrophilic bacterium, Bacillus pasteurii is added, which can survey at high pH of 9 to 13 and at the temperature range of 10 to 40 degree centigrade. Capsule of 15 kg is added to a 1m3 of concrete. The spores became active when getting contact with water, still it will be inactive in concrete. When bacteria contact with carbon-dioxide and convert calcium hydroxide to lime stone. On reaction CO2 is arrested from diffusion. Limestone will fill the crack and there is no possibility to leakage of water and diffusion of carbon-dioxide. Hear our primary aim is to prevent the carbon-dioxide penetration and then to prevent the water infiltration to concrete. In self-healing concrete capsule containing bacteria and calcium lactate is added. In atmosphere quantity of CO2 is less to speed up the self-healing process calcium lactate is added in which it precipitate CaCO3 and liberate CO2. 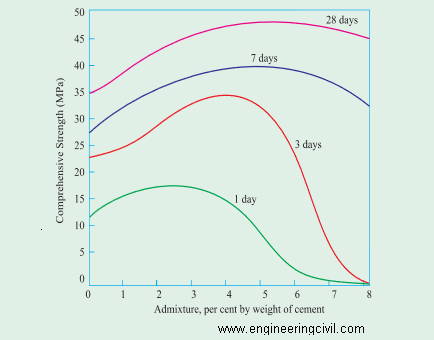 Water cement ratio in the concrete plays an important role in the strength and durability of the concrete. It has also been estimated that on an average 23% of water by weight of cement is required for chemical reaction with Portland cement compounds. This 23% of water chemically combines with cement and, therefore, it is called bound water. A certain quantity of water is imbibed within the gel- pores. This water is known as gel-water. It can be said that bound water and gel-water are complimentary to each other. If the quantity of water is inadequate to fill up the gel-pores, the formations of gel itself will stop and if the formation of gel stops there is no question of gel-pores being present. It has been further estimated that about 15 per cent by weight of cement is enof to fill up the gel-pores. Therefore, a total 38 per cent of water by weight of cement is required for the complete chemical reactions and to occupy the space within gel-pores. If water equal to 38 per cent by weight of cement is only used it can be noticed that the resultant paste will undergo full hydration and no extra water will be available for the formation of undesirable capillary cavities. On the other hand, if more than 38 per cent of water is used, then the excess water will cause undesirable capillary cavities. Therefore greater the water above the minimum required is used (38 per cent), the more will be the undesirable capillary cavities. In all this it is assumed that hydration is taking place in a sealed container where moisture to and from the paste does not take place. 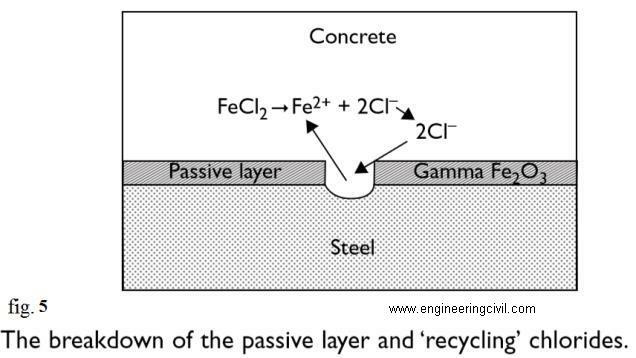 Increases in cavity in a concrete increases the coefficient of diffusion in concrete. At a same time it is difficult to work in concrete at water cement ratio of 0.38. However addition of water to the concrete for a workability is not a good construction practices. Super plasticizer and new generation plasticizer is recommended for workability. Addition of plasticizer increases the strength up to optimum level above that it decreases the strength. Fig.8 shows the variation of the compressive strength of the concrete at various volume of lingo-sulphonate. Hence optimum ratio of plasticizer is recommended. Plasticizer reduce water content up to 10%, super plasticizer reduce about 20%, pc based admixture reduce up to 30%. Even through, we had a good design, material and scheduling it is impossible to attain strength and durability without good workman ship. For an example Masan will add water in mortar and shovel it. During this process fine partial cement settle down and only sand will available for the plating above. Hence workmanship is more important than any other in construction. For every problem there is a simple solution one of the simple solutions for the corrosion is to provide proper cover to the reinforcement. Nominal cover shall in any case not be less than 40 mm. 1)	John P. Broomfield; “Corrosion of Steel in Concrete Understanding, investigation and repair”, Taylor & Francis 270 Madison Ave,New York,NY 10016. 2)	M.S. Shetty; “concrete technology theory and practices”, S.Chandra and company ltd, Ram nagar , new Delhi. 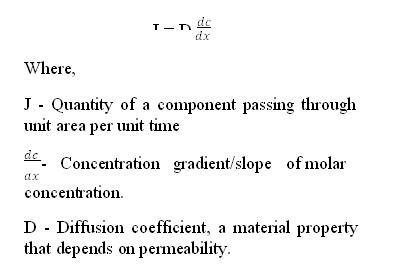 3)	IS10262-2007	“Recommended Guidelines for Concrete Mix Design”, Bureau of Indian Standards, New Delhi, 2007. 4)	M.V. Seshagiri Rao, V. Srinivasa Reddy, M. Hafsa, P. Veena and P. Anusha, “Bioengineered Concrete – A Sustainable Self – Healing Construction Material” , ISSN 2278 – 9472. 5)	Ruben Boelens,	Jeroen Goedhart, Stijn Jagers,	Roel Oldenkamp, RSG Pantarijn, Wageningen,	Self – healing concrete – A concrete solution for a concrete problem . 7)	Björn Lagerblad “Carbon dioxide uptake during concrete life cycle – State of the art”, ISBN 91-976070-0-2, ISSN 0346-8240. 8)	Ravindranatha, N. Kannan, Likhit M, “Self-healing material bacterial concrete”,IJRET: International Journal of Research in Engineering and Technology, eISSN: 2319-1163 | pISSN: 2321-7308. 9)	Achal, V., Mukherjee, A., Basu, P . C., and Reddy, M. S. (2009). “Strain improvement of sporosarcina pasteurii for enhanced urease and calcite production.” Journal of industrial Microbiology and Biotechnology, 36, 981-988. 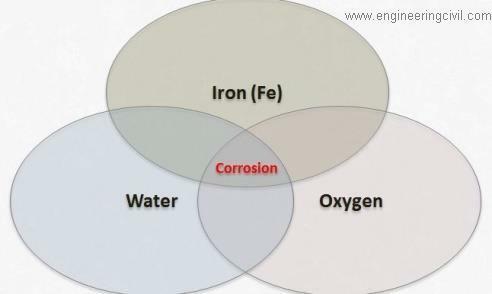 We at engineeringcivil.com are thankful to Anbarasan R for submitting this very important paper on “Prevention of corrosion in RCC by bacteria” to us. What is the difference between carbonation and carbon dioxide attack? Why do BS8007 specify the allowable crack width of water retaining structure as 0.2mm for severe or very severe exposure? Nice project in the field of civil engineering. In above project how to we can make it more practically?